I know it sounds illogical at first. Who ever heard of the same numbers being picked twice in a row..? Never happened right? But the reality is it could happen. Yeah, OK, so it could – but it’s still far less likely than other numbers, right..? It’s EXACTLY as likely as all the other numbers. Or to put it another way, it’s exactly as UNlikely as all the other possible results. Because all combinations are unlikely anyway. That’s the nature of a lottery, there are millions of combinations. So everything is unlikely. But equally unlikely. We Did WHAT Last Week..?! You see there is no ‘memory effect’ here. Those little balls have no brains, so they don’t know what happened last week. They just bounce around and pop out again without the slightest idea of what last weeks numbers were. This myth is exactly the sort of thing those junk lottery systems use to take your money. It’s a nice claim. But sadly it just isn’t true. So when it comes to picking lottery numbers, excluding past results will NOT help your chances of winning. Right? even if you are right you can’t say this israel women is a scammer she said if i hit the jack i must pay her 10% she won 4.000 000 in israel lotto . i paid her 95 usd each month . in wheeling i pick 10 balls on her method i match 5 numbers . if you say that is bunch of luck than you don’t have this kind of knowledge of lotto that was a test not play so even i failed with ghana guy i have a good chance with israel women . Nobody can pick numbers that are more likely to win – so paying anyone for numbers is plain crazy. Whether you pay them by cash upfront or in promised winnings. Of course it was luck. Miracles do happen. If some chap falls off a moving train and survives, if some chap recovers from a terminal illness – there is an element of luck in the life of men. We all see instances of luck playing a part in our lives. So the best thing to do is choose any set of numbers which fancy takes, and trust in luck. Does it happen every year in the world of the Lotto that people do not win for many weeks before Christmas, and the jackpot becomes big for Christmas/the new Year..? Yes. It’s Santa Clause at work :-). What about the certain individuals who have won the lottery several times? In Alberta, Canada, there was a certain man who was refused his winnings because it was his third win. How are they able win the lottery more than once? It’s always luck at the end of day. You can apply good strategy to maximise your chances, but luck will always be the deciding factor. I don’t know the story of a man being refused for winning 3 times – are you sure of the facts on this? Because to my knowledge nobody has ever been refused a prize anywhere in the world purely for winning too often. When claims are rejected it’s normally for fraud, stolen tickets or other disputes over who really owns the winning ticket. I do remember a story about ten years ago about that happening, although I can’t seem to find it, on the Internet, there was a man in Airdrie, Alberta, Canada which is next to Calgary, won the Lottery 5 times. Is it luck or strategy or both? That must be Seguro Ndabene. He won 4 times (between 2004 and 2009, wins ranging from $50,000 to $1M). He did have a dispute over his 5th win, but not because he kept winning – it was because another player challenged his claim to be the sole winner. It was eventually settled by the courts with the full payment of $17M going to Seguro. Seguro says he has no system (he bought random numbers), but admits that he buys “hundreds of tickets” – which helps a lot :-). He’s also part of lottery group too, but didn’t say how many tickets they buy. So reading between the lines, you can only imagine how much of his earlier wins he spent on more tickets (the same ‘secret formula’ which also nicely explains Richard Lustig’s wins…). I have to laugh at the misunderstanding above. Using the current 5/69 + 1/26 of Powerball, there are 11,238,513 unique five ball combinations. Multiplying this by the 26 numbers of the power ball gives a total of 292,201,338 unique combinations that would win a jackpot prize. 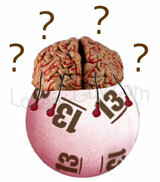 The chance of any given jackpot combination being draw is 1/292201338 – a vanishingly small number. Buying more unique tickets increases the odds of of winning by n/292201338, where n is the number of tickets bought, and still a vanishingly small number for any reasonable amount of ticket purchases. There is no system memory, therefore the odds remain the same from play to play. If you examine the number of pairs, there are 2346 unique pairs. If you want non-unique pairs there are 2346 pairs repeated 47905 times each. If you want quadruples, there are 864,501 unique quadruples. Each unique quadruple is repeated 65 times. Triples are a slightly different proposition. Some combinations of triples are repeated 2145 times and range down to only a single instance. Triples have a mathematical bias towards sets that start with 1, 2, 3, 4, and 5. However when divided by the number of total combinations, the probability of the highest combinations of triples – those starting with 1 – is still approaching zero (1.9 X10^4 or 1 /5239.4).